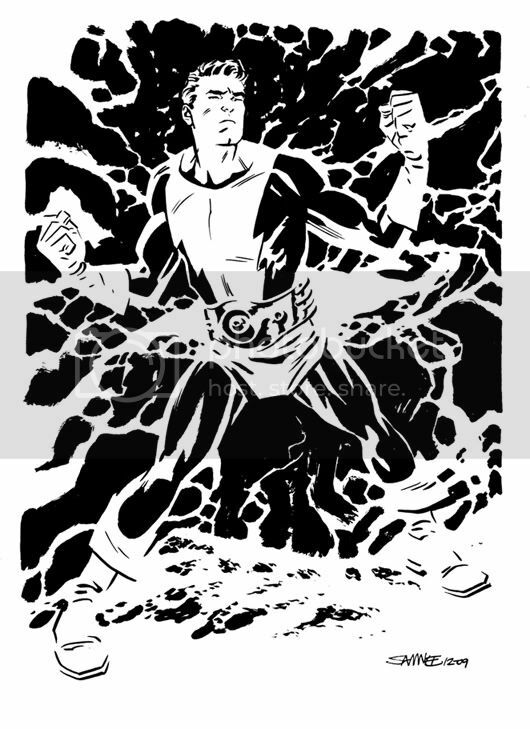 Dynamo here is just one of a number of great Wally Wood creations that made up the T.H.U.N.D.E.R. Agents. DC Comics announced back in July that they had obtained the publishing rights to new adventures of The Higher United Nations Defense Enforcement Reserves. I like all of your drawings especially batman!! You look to be throwing your hat into the ring with this kicka$$ rendition of Dynamo. If the T.H.U.N.D.E.R. Agents are revived, I think that the powers that be at DC should take a long hard look at handing the artistic reins over to a certain St. Louis suburbanite. Thunder Agents was one of my first comics and it made a big impression on me in large part due to Mr. Woods incredible art. Your dynamic drawing of Dynamo brings back some great memories for me. It's the way there's no lines amongst the black and white bits of the piece that make it pop for me. Really nice.